The news of the big announcement comes after speculation that frontman Dave Grohl could be set to start a solo career. Taking to their Twitter account on Tuesday night (01.02.16) they wrote: "Official band announcement tomorrow night. Stay tuned." Many fans have aired their concerns on social media that the 'All My Life' rock group - which also includes Taylor Hawkins, Chris Shiflett, Pat Smear and Nate Mendel - are going to announce they are splitting up. However, a spokesperson for the band said the claims are "utterly ridiculous". 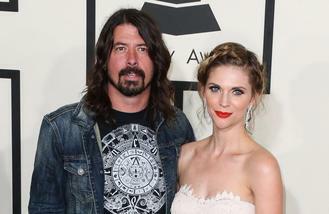 The heavy rockers are believed to be on a hiatus, however, and a source close to the group has claimed 47-year-old Grohl - who is married to Jordyn Blum - is planning to go it alone. The insider shared: "The band is billing it as a 'break,' but it's totally Dave going solo, and Taylor is p***ed about it." It has also been reported that Grohl's acoustic cover of The Beatles song 'Blackbird' at the Oscars on Sunday night (29.02.16) marked his first foray into the industry as a solo artist.